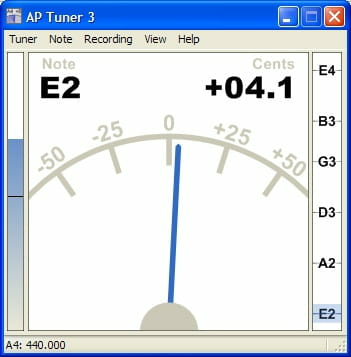 Designed by Audio Phonics, AP Tuner is a full chromatic tuner or a musical instrument's tuner of your instruments on your PC. Open Tunings: Ideal for guitarists and beginners who want to go on their own, this software is fully customizable. It is far better that electronic tuner thanks to its sheer amount of options. The music lover can view, listen to a graph the musical notes. The library of sounds is customizable according to the user's needs. A Minor Windows layout issue is fixed so that the user can activate a window by only clicking the inside of the window instead of the titlebar. A brand new "harmonic graph" window has been added for the harmonic visualization of the contents. Capture: It captures the audio microphones for acoustic instruments and at the same time inputs line for electric instruments. Its accuracy helps the users to choose between several different tunings according to their needs. The interface is simple and straightforward to browse. Latest update on June 12, 2014 at 06:06 AM.